We teach physicians the science and art of military medical acupuncture to provide service members and veterans with the best combination of conventional Western medicine and integrative treatment for a lifetime of care. Acus Foundation has a flagship program housed in the Family Medicine Residency (FMR) Clinic of Nellis Air Force Base in Nevada. Since 2015, our teaching team has trained all staff and resident physicians in our 300-hour medical acupuncture course. The Economist Intelligence Unit named the Nellis program one of eight initiatives nationwide successfully combating the opioid epidemic, thanks to a 45% drop in opioid prescriptions in patients who had Acus medical acupuncture added to their treatment plans. Acus medical acupuncture training is highly specialized as it has been developed over the past decade to address military-unique conditions, such as combat-related post-traumatic stress and service-related musculoskeletal injuries (e.g., post-traumatic stress, kit back, cobra neck). The medical acupuncture program at the Nellis FMR is the only one of its kind in the country, military or civilian. Every patient has the chance to receive acupuncture at any appointment, either by request or recommendation of a doctor. There are no waiting lists or outside referrals. There has been a documented 45% drop in opioid prescriptions in a sample group of patients who had Acus acupuncture added to their treatment program. One Army veteran being treated at the clinic said, “Acupuncture saved my life.” He had been on opioid painkillers for six years, and within six months of starting acupuncture treatments, he was able to wean off every one of them. The clinic performs between 400-600 acupuncture treatments for active duty service members and veterans per month. Physicians at Nellis AFB estimate that demand for acupuncture is growing by 20-25% each month. Additional results of the acupuncture program include a 34% drop in muscle relaxer prescriptions, a 14% drop in anti-anxiety medications, and $250,000 in cost savings in off-base referrals for pain management. The doctors trained by the Acus team have taken the philosophy of Think Acupuncture First with them to other bases and while on deployment. They have embraced our mantra: More needles, fewer pills. 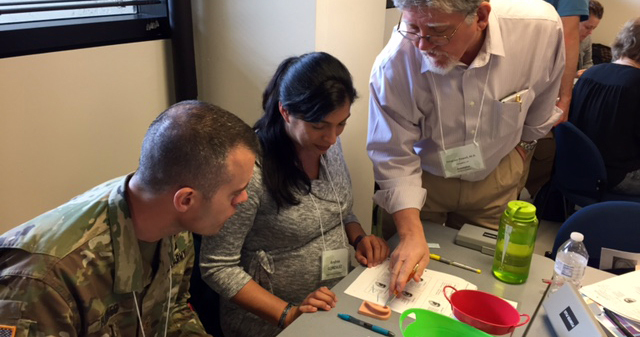 In August 2018, the Acus team began training its fourth cohort of military physicians. Doctors from three other AFBs (Eglin, Scott, Offutt) and the Las Vegas VA joined the resident physicians of Nellis Air Force Base in our military medical acupuncture course. Since its inception, 46 staff and resident physicians and 2 physician assistants have graduated from this flagship training program, the most comprehensive of its kind in the country. Our fourth cohort, an additional 21 physicians and 2 physician assistants, will graduate in June 2019. The fifth cohort will begin its training in August 2019, with an anticipated graduation date in May 2020. Acus offers one-day seminars in several locations to teach the insertion of needles into the surface of the ear as a stand-alone treatment or in conjunction with conventional methods for pain, trauma, and stress disorders. Advanced Military Acupuncture Skills Training, San Diego, California; Bethesda, Maryland: Advanced training to military physicians who have completed an Acus acupuncture course. The program reviews fundamental clinical skills and introduces specialized acupuncture protocols to treat conditions frequently seen in the military. Acus Instructor Retreat, Nantucket, Massachusetts: Three days of research presentations to compare treatment results and assess the best pedagogical and clinical approaches to military medical acupuncture.